I’ve wanted to re-do the main bathroom since I first saw this house. 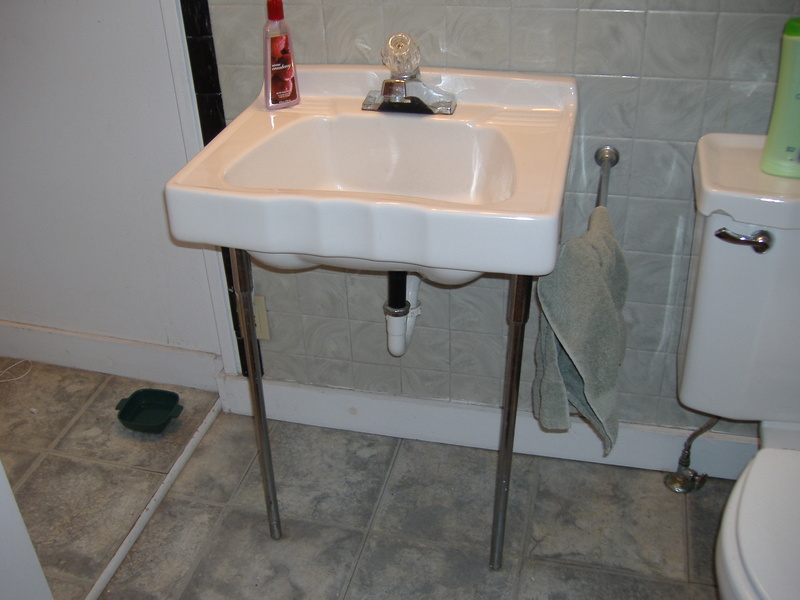 The plastic tiles on the wall are ugly, the “pedestal” sink has rusted metal legs and lacks storage, and the mini-size bathtub is too short to allow for an actual bath. And don’t get me started on the Hollywood Barbie light fixture! But an old house has all kinds of fun limitations as far as sizes and walls. The ceiling slopes with the roofline, so I didn’t even notice that the tub was miniature (4 feet, compared to the standard 5 feet) until the first time I tried to take a bath and my knees stuck up in the cold, cold air. But the water for the tub is run in the wall that creates a strange little dead space around the window. I can’t fit a standard 5 foot tub in that space without running into the window – and the room isn’t long enough the other way, either. My dad suggested a corner tub, but my research found that most of those are at least 5×5. Except for one. Menards carries a 4×4 ft corner tub (with a hypotenuse of 4 √2 – just long enough for a proper leg stretch, as I tested in the store). Just after Christmas, it went on sale, so it’s been sitting in my parents’ garage since mid-February. We’ll destroy that wall entirely, which should open up the room greatly. 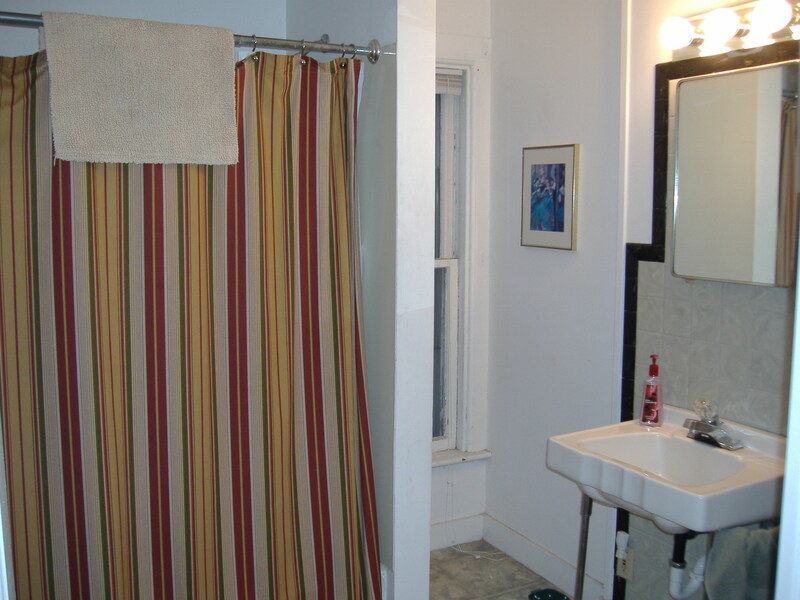 Since you can’t put plumbing in an exterior wall in northern Illinois (at least, not in an old, under-insulated house), we’ll leave the shower plumbing external, which was pretty common in old houses. It should look really nice. And the rest of the room will have so much light! I had to replace the window before I could begin. The old window leaked terribly – not what you want in a bathroom – and never stayed up without a prop. I ordered windows in January, and they were installed in mid-March. Once the quarter ended, I finally had time to think straight. 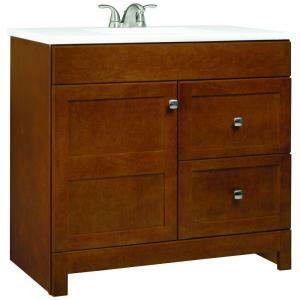 I had been looking for a vanity off and on ever since January, and seen a couple of styles I liked. I really wanted to match the character of the house, and the honey-cherry shade of wood prevalent throughout my house. I have a large built-in linen closet across the hall from the bathroom, and I wanted to mirror it if at all possible. I really liked one I saw at Home Plus Outlet in April, but it was a bit too wide. (You can see above how the wall indents about two inches – since the walls are solid, I’m assuming that’s how previous owners were able to add electric and plumbing, since my house was built before either of those novelties were common.) My dad and I examined the wall and determined that yes, we could build up the wall and make the vanity fit, but by that time, it was no longer for sale. The same thing happened several more times. Every time I would find one I liked that would match, I would discover that it was no longer being made and didn’t exist, except in dead listings on websites for the three Big Boxes. Finally, I found one that, while nonexistent in every Home Depot near me, was still in stock (albeit discontinued) at a couple of HDs in Chicago proper. Since I was heading into the city for brunch today anyway, I could pick it up, and it would fit in the new car. So I did, thankful I bought a car with cargo space. I may swap out the hardware, but the color and Mission styling fit pretty well. And drawers! On my dad’s advice, I carefully measured everything in the room and am making a scale model on graph paper, including every water spout, vent and more. I had a momentary panic when I realized that the new vanity (with a real cabinet! And storage!) would block my only outlet, but Dad pointed out that the existing outlet is against code and needs to be several feet higher, anyway, so we’ll move it when we tear open the wall. Not visible: the rust stains on the "legs" of the monstrosity. 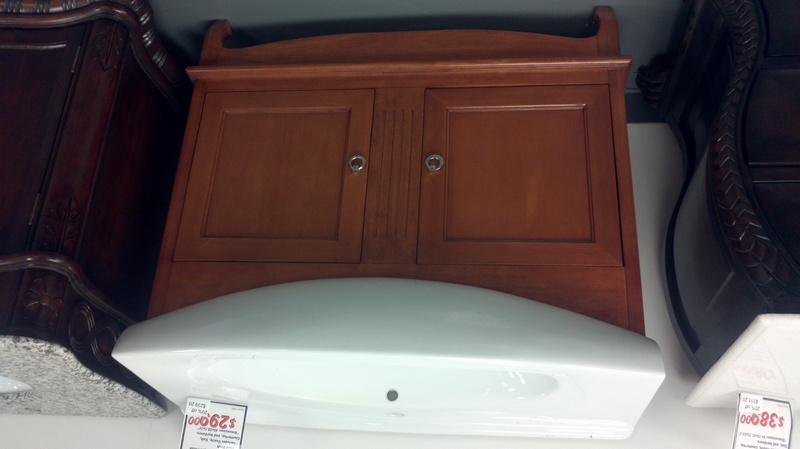 And really, having storage and wood will be so much nicer than this “pedestal” sink. A plumber is coming this week to give me an estimate on replacing the bathtub, as it will entail moving some pipes. Once that gets rolling, my dad and I can do the rest – hopefully with a minimum of shower-less days. I’ve been looking at toilets, faucets, light fixtures and tile – I can’t wait to get started! This entry was posted in House projects and tagged Bathroom, House projects. Bookmark the permalink. Ah, the irony – I looked for and wanted that sink you a e getting rid of but new ones with the legs were out of our price range! And our only outlet in the downstairs bath is….part of the old light fixture! Yup – not code! Enjoy your new bathroom when done! Now you have me wanting a project here! The sink itself is nice looking and in good shape. The legs definitely need to be replaced – but you’d be welcome to it if you like! Otherwise I’ll probably donate to ReStore. Volunteering to come over and help with demo if you need it 🙂 I love ripping out walls!